Cooking is something I love doing, it’s relaxing and creative to me in the same way as painting is to others. But I think the thing that most appeals is not just the fact you can eat your creations, it’s that the results are (relatively) instant and the choices are infinite. As opposed to the colours on a palette, the flavours on your palate are limited only by your imagination and bravery. There are a million different foods out there to enjoy, and an infinite number of combinations to discover. So here are some combinations that you might not have tried - some are the pairing of ingredients you mighty not expect whilst some are food and drink matches which seem unusual, but work - all are delicious and well worth a try. I know what you’re thinking, cream, oil, salt!? But it actually works. Take a few scoops of very good plain ice cream (either vanilla or a plain milk ice cream, preferably homemade) and drizzle with a very, very good olive oil before sprinkling with a few flakes of good quality see salt. This combination lives and dies by its ingredients - so only do this one with seriously good icecream, oil and salt – but trust me, it works. Why it works: A good quality, peppery, fresh olive oil has a surprisingly non-greasy mouthfeel and simply acts alongside the salt to season the icecream and extenuate the creaminess and sweetness in your mouth. Weird, but great. Whilst many people will tell you that India Pale Ale is the only choice when it comes to curry, they’re wrong - it’s much more complicated than that. Clashing bitter hops against fiery chilli can sometimes work, but often you need a little malt sweetness to stop your mouth feeling like it’s taking a battering. So next time think about a darker, more roasted tasting beer to go with that smoky, spicy curry – especially if it contains lamb or beef, which both work great with porter. Why it works: Paired with an umami-laden tomato-based curry like rogan josh, porter works amazingly well. The savoury, smokey roasted malt dovetails perfectly with the spicy tomato and the added malt sweetness soothes your tastebuds between mouthfuls of chilli heat. I feel like I’ve been banging on about this one for years but I’m going to keep doing so until everybody has tried it. It shouldn’t work, it sounds ridiculous, but it really, really works. 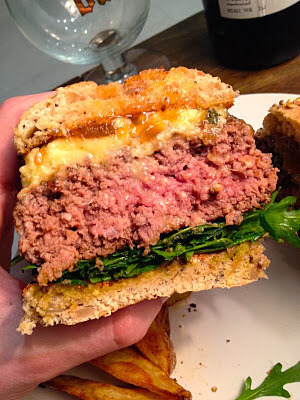 Next time you’re making a burger at home generously smear the bun lid with a sweet mango chutney (nothing too fancy or spicy is needed) and top the burger with a thick slice of blue cheese (I like stilton) – you will be amazed at how good this tastes. Why it works: The cheese and chutney combo is well known but this leftfield example works great as the sweetness of the mango contrasts amazingly with the funky, slightly sourness of the blue cheese. Thai food is notoriously difficult to pair with beer. Sure Chang will work fine if you want a palate cleanser, but in terms of really bouncing flavours around you need to look for a beer that’s much more complex. Thai food is a balance of salty, sweet, hot and sour flavours, often with creamy coconut complicating things further. So you need to go for a beer that is just as varied and complex, and hopped up Belgian beers like the excessively named La Chouffe Houblon Chouffe Dobbelen IPA Tripel fit that bill perfectly. (Or alternatively a hoppy saison would work too). Why it works: The La Chouffe IPA is a complex mix of fruity esters, smooth sweetness which works to quell the heat of thai food and big, floral hops that seem to highlight the ginger, lemongrass and coriander top notes of many thai dishes. It has a lot going on but somehow works perfectly with a number of Thai dishes I’ve tried, from green curry to spicy papaya salad (Som Tum)- it works amazingly well. What unusual or surprising combinations have you enjoyed? I’d love to hear your suggestions. Dirty, greasy KFC original recipe fried chicken & Orval. Don't bother making your own. Just grab a bargain bucket. I could see how that would work actually... The effervescence and hoppiness of the beer would cut through the grease I reckon. That looks delicious. will surely try it out soon!